Most people, even mental health professionals, do not think about emotional deprivation and emotional neglect as two separate things. And I understand why. In some ways, these two childhood experiences are very much the same. But in some very important ways they are very, very different. And I’m on a mission to make sure everyone knows just that. Childhood Emotional Deprivation: Happens when there is an extreme absence of emotional attention and/or response given to an infant or child by her primary caretakers. Has been documented in orphanages, and in families where there are extreme physical absence of caretakers, abuse and trauma. 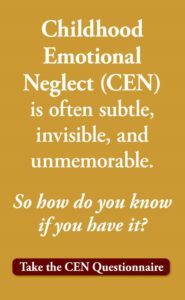 Childhood Emotional Neglect (CEN): Happens when a child’s primary caretakers (usually his parents) fail to respond enough to the child’s emotional needs. Happens often in normal homes all over the world, even when the parents are physically present, and all the child’s material needs are met. So both emotional neglect and emotional deprivation involve a shortage of emotional attention and response from caregivers, but they tend to happen in different types of situations, and can play out very differently in the children’s lives as they grow into adulthood. If you think about it, almost everything is most noticeable in its more extreme forms, right? It makes sense that emotional deprivation would be noted and studied long before emotional neglect is identified as a true issue. Emotional Deprivation was first identified as a problem in Romanian orphanages, in 1952 by Dr. Rene Spitz. His heartbreaking video taken inside an orphanage, shows the devastating effects of emotional deprivation upon infants. Since that time, multiple studies have found negative effects of emotional deprivation upon the infant brain. They include reduced brain volume, changes in the prefrontal cortex, and high, disregulated levels of cortisol (the “stress hormone”) in their brains. In 1999, Megan Gunnar studied the effect of emotional deprivation upon post-institutionalized kids. She found that they tend to have difficulty with executive functions such as cognitive flexibility, inhibitory control and working memory. They are often impaired in their ability to understand the mental states of others and regulate their own emotions. She found that many of the children suffered from high anxiety. Happily, studies have also found that many of these neurological and social effects are reversed over time for emotionally deprived children when they are adopted by loving, emotionally attentive parents. During ten years of working in my private practice, talking with client after client, I began to see a specific pattern of struggles emerge. I saw the pattern in clients who had grown up wealthy or poor, who were married or single, successful or struggling, men and women alike, and regardless of age. 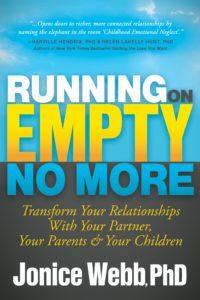 Here is the pattern I noticed: A deep feeling of disconnection from self and others, feelings of emptiness, extreme independence, low self-knowledge, low self-compassion, excessive self-blame and shame, low emotional awareness, and struggles with self-discipline. The clients in whom I saw this pattern seemed to have little in common other than this special group of symptoms. After seeking answers in my clients’ childhoods to no avail, I realized I was looking in the right place, but for the wrong thing. I had been asking what had happened to them in all of these people’s childhoods to lead them to feel this way in adulthood. But what I actually found was that something had failed to happen for them in childhood. Each of these folks had grown up in households that somehow, for whatever reason, were not attentive or responsive to their feelings enough. It’s hard to believe that a non-experience like this can lead to such significant effects, but believe me, I and many others have now seen that it does. In the last 5 years, since I became aware of Childhood Emotional Neglect, I have helped scores of people recover from it. I have seen, beyond a shadow of a doubt, that you can fill the gaps left by your Childhood Emotional Neglect. I have watched lovely people work themselves from a place of living their lives in a CEN bubble, feeling isolated, disconnected, alone, and in some indescribable way, deeply flawed, to a place of feeling alive, feeling their feelings, feeling the warmth of connection, and seeing the bright colors in their world. In my opinion, the primary difference between these two childhood experiences is that one is more extreme than the other. Emotional deprivation happens when a child is literally deprived of emotional nurturance during his formative years. This has happened in institutions where children are left on their own. But sadly, it can also happen in families. Real homes, real parents, completely ignoring their children and their needs for comfort and happiness and love. Emotional Neglect, on the other hand, is a milder version of being emotionally deprived. It happens in homes all across the world, often inadvertently delivered by otherwise loving, caring parents. It can be subtle when it happens, but it usually leaves the child feeling, in some indescribable way, deeply inconsequential, and deeply alone in the world. Is the emotional dis-regulation, impaired ability to understand the mental states of others, and difficulty regulating their own emotions that Megan Gunnar saw in the severely emotionally deprived children simply a more extreme version of the lack of emotional awareness and low emotional intelligence of those who grew up with Emotional Neglect? It’s a question that I hope will, one day soon, be answered with research. I do strongly believe, based on the research combined with my own experience as a psychologist, that in one important way, Emotional Deprivation and Emotional Neglect are alike. Just as the effects of emotional deprivation can be reversed by a loving adopted family, the effects of emotional neglect can be reversed by purposely making a decision to treat yourself as if you matter. By listening to your own inner voice, caring about your own feelings, and attending to your own needs, you become your own emotionally attuned, and emotionally attentive parent. Since emotional deprivation and emotional neglect are not the same, affecting different people in different ways, my goal is to make more therapists aware of the far more subtle, far more widespread effects of Childhood Emotional Neglect (CEN), how to identify it in their clients, and how to heal it. One thing that I can say with confidence true and clear is that if your brain can recover from emotional deprivation in childhood, you can reverse the effects of Childhood Emotional Neglect in your adulthood. The most important uniting quality of these two painful childhood experiences is that they both can be healed. 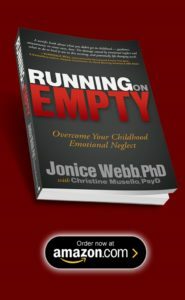 Childhood Emotional Neglect can be subtle and unmemorable, so it can be difficult to know if you have it. To find out, Take The CEN Questionnaire. It’s free. This speaks to hope in the brain being changed in childhood if the child is adopted by a loving, safe family but it doesn’t speak to hope the same can occur if they are not… if emotional deprivation is what they grow up with. Can you pls comment Dr. Webb on the outcome & what can be done/how much it will impact the brain etc if a person has grown up with emotional deprivation their whole childhood; I am trying to learn what degree my brain can change, to have a sense of hope as you’ve given others here but is not addressed in the specific situation of not being adopted out but having to live with it. Thank you. Dear Summer, I can only tell you that I see tremendous progress in people who grew up in Emotional Neglect once they start doing the treatment steps I have identified. I hope you will start them yourself, and then let us know your experience. I was adopted at birth. I had a perfect( so I thought) childhood till 8 yo when my mother was diagnosed with breast Cancer. She died when I was 11.Until he remarried when I was 12. She was a brutal woman and I left home at 14 and was alone till 18 I have always felt alone. I am 70 and have no family and few friends.I can’t wait til it is over. Yes, I think when you are neglected, you believe you should be alone, so even when some person tries to show you some attention, it doesn’t feel right. It feels like you have done something wrong if you even approach someone else in order to try to make any kind of social connection with them. And then our own instinctive feelings of wanting to make a friend or be included are also making us feel bad, because we are not socially involved. I find that whenever I feel at all listened to, like what I say is actually tolerated and I feel that someone has some natural interest in what I say, that I feel good for a while. So, I wish there was some general encouragement to those who try to help, to become good listeners. The worst people you talk to give you advice, like they want to solve your problems in just a few minutes. How I feel is that they are just trying to stop you from talking because they aren’t interested, and it is making them uncomfortable, and they believe that the thing to do is give you a solution. But what you needed is to be shown that you are actually interesting and a real person. Hi dfk, yes that sounds exactly like the effects of CEN. But many who give advice are honestly wanting to help, so please consider the possibility that not everyone who is trying to help is motivated as self-centered disinterest. I hope you’ll keep trying to share and take risks in this area! I always accepted that they were trying to be helpful. It’s dealing with the feelings at the time that they are sort of recoiling in discomfort just because it’s me. My parents always brushed me off with “just do the best you can” whenever I had something I wanted them to know, so for someone to listen to me feels wrong, like I am putting an unfair burden on them. Dear Myra, I thank you for taking the risk of writing. Your life and your feelings are so important. I share your feelings about loneliness and no one caring, and am also in my 70s at age 74. I also have few friends. I just want to let you know that you are not alone. My therapist tells me that he cares but I have trouble trusting him because what I think is caring is not the same as what he means. I am currently trying to figure out what it is and whether it exists for me. I wonder whether we could try this together and correspond about it? Please let me know. I have written before about a different subject. I am a CEN patient largely due to the Holocaust. I do not know why my own children treat me as worthless. My wife has a similar background to mine and is not treated that way. She grew up in the USA while I grew up in Austria among the purpetrators. How may I overcome my own children?